By Tommy Robbins. It’s a peculiar time for games media and criticism (or: it continues to be a peculiar time for games media and criticism, take your pick), and Bethesda certainly ain’t making it any less complicated. The developer announced on Tuesday that they’ll be taking a new stance on the release of early review copies, one that offers little time for critics to produce informed reviews before a game’s release. Why? So we, gamers and critics alike, can experience Bethesda’s games at the very same time. Isn’t that thoughtful. 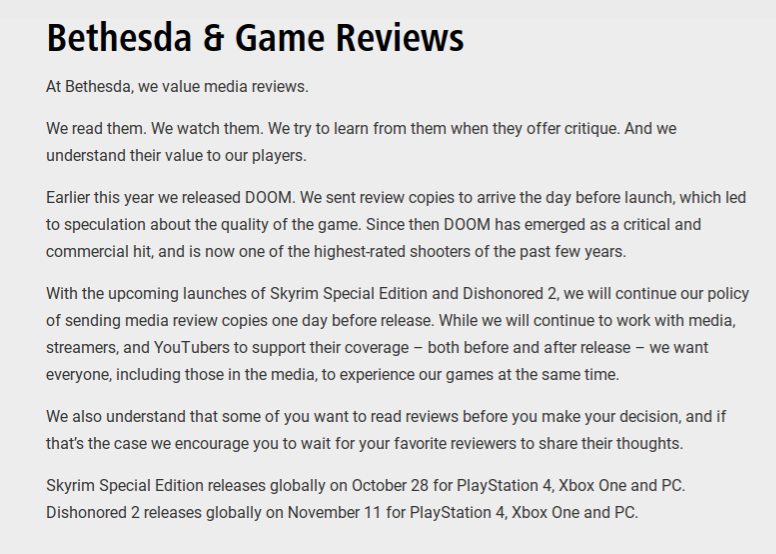 In their statement, Bethesda took a moment to remind us all of that one time they released the universally well-received DOOM to critics only a day before the release date, which caused a swarm of negative speculation. Well go figure — when writers and their audiences see games held until just before their release in the games entertainment industry, it often leads to worry about the publisher’s and developer’s faith that their product will live up to heightened expectations — which, ironically enough, are usually built by the publishers own very expensive (and very pervasive) marketing campaigns. So, what was their point exactly? DOOM proved that receiving review copies late doesn’t necessarily mean anything bad, right? In that context, Bethesda’s claim that we should all experience these products together seems perfectly reasonable. Only it’s not. In the past, Bethesda has had a reputation for refusing coverage to those who don’t adhere to their specific marketing plan. Kotaku has been blacklisted from the privileges of other media outlets for years for this very reason, and as Stephen Totilo pointed out in a recent article, Bethesda’s “games for everyone at the same time” decree isn’t totally in line with their practices. Late last week, gaming enthusiast/YouTube personality/habitual shill Grohlvana went public with the first in a series of videos for the upcoming Skyrim Special Edition, which he received after Bethesda tossed him a copy for his noted obsequiousness towards the developer. His enthusiasm for the product, not an ability to make informed criticism, landed him an early copy one month early. It would seem that Bethesda isn’t worried about providing copies to everyone at the same time. Instead, it appears that they’re investing in positive press first and supplying objective critics precisely what they need later. With publications no longer expecting review copies early enough to influence the consuming public, Bethesda has found themselves in a place of power as the marketing arm of their company swings freely, picking and choosing where and when to disperse information about their games with impunity. Which is their right. So what does the gaming community think of this? Bethesda isn’t releasing review copies even though all their games are buggy on launch and still get 10/10 reviews. And if you see launch day reviews for any lengthy Bethesda games you’re going to wonder if outlets brokered deals for advance access. Bethesda’s dismissal of reviews seems like the beginning of the climax of the animosity between publishers and games media. This is not the worst thing that could happen in the industry but it definitely begs the question, “what is the future of video games coverage?” As the ever-expanding world of Video Games Criticism reaps more and more honest, diverse, and nuanced opinions, developers and publishers appear to be seeking the blind enthusiasm of yesteryear, where critics were simply happy to be involved in the process, doling out high review scores and singing praise basically in thanks for being allowed to just hang around. Instead, developers are turning to YouTube “influencers” rather than the critics they have relied on for so long. For years, gamers have turned to their favorite critical personalities to ensure they make informed purchasing decisions, because let’s face it: Developers sure as hell ain’t selling jelly candies. That sixty-dollar sandbox action game may be a tremendous gamble — so how do you inform your purchase? The dichotomy between critics and consumers has existed to keep people from buying into hype machines, blindly throwing cash into high-profile games that often turn out to be distressing, disappointing, or just plain lousy experiences. Games entertainment media depends highly on the relationship between the developers and critics. While Bethesda is an interesting case, having released some of the more well received games in recent years, it’s important to be mindful of these shifts in trends. As games critics and journalists are pushed more and more to the back, “influencers” are snatching a place in the limelight with their paid-for opinions, bought cheaply by the thrill of a free, early copy. What do you think about all this nonsense? Is Bethesda in the right? Does criticism still have a place in the gaming community? Sound off in the comments section below.